Jeffrey M. Stanton, a widely published and respected scholar and a seasoned university administrator, has been appointed associate provost for academic affairs. He succeeds Andria Costello Staniec, who after more than four years as associate provost will step down from the post to return to the faculty of the College of Engineering and Computer Science. Stanton’s appointment is effective July 1. In his new role, Stanton will assist Vice Chancellor and Provost Michele G. Wheatly with the daily operation and optimization of the Division of Academic Affairs. He will play a critical role in supporting and implementing the Academic Strategic Plan and aligning it with the University’s physical presence and infrastructure. Stanton, a faculty member in the School of Information Studies (iSchool) since 2001, served as interim dean from January 2015 to May 2016. Before that, he was the iSchool’s senior associate dean and chair of the University’s Institutional Review Board. During the 2012-2013 academic year, Stanton was a fellow of the American Council on Education in its emerging leaders fellowship program. He is also a graduate of the EDUCAUSE/CLIR Leading Change Institute. In 2011, he was named the University’s first associate vice president for research, a rotator position intended to strengthen the connections between the Office of Research and researchers in the schools and colleges. Stanton also helped to design the iSchool’s Innovation Studio, a classroom environment designed to encourage hands-on, problem-focused learning. Stanton is the co-author of “Information Nation: Educating the Next Generation of Information Professionals” (2010) and “The Visible Employee: Using Workplace Monitoring and Surveillance to Protect Information Assets—Without Compromising Employee Privacy or Trust” (2006). He has also published scholarly articles in peer-reviewed behavioral science journals, such as the Journal of Applied Psychology, Personnel Psychology and Human Performance. His articles also appear in the Journal of Computational Science Education, Computers and Security, Communications of the ACM, Computers in Human Behavior, the International Journal of Human-Computer Interaction, Information Technology and People, the Journal of Information Systems Education, the Journal of Digital Information, Surveillance and Society and Behaviour & Information Technology. Stanton’s background also includes more than a decade of experience in business—both in established firms and startup companies. He earned a Ph.D. and a master’s degree in industrial/organizational psychology from the University of Connecticut, and a bachelor’s degree in computer science from Dartmouth College. As Stanton’s appointment marks the conclusion of Costello Staniec’s tenure as associate provost. Provost Wheatly thanked her for her deep commitment to student academic success, her dedication to academic and research excellence and her hard work on behalf of the University’s academic vision and mission. 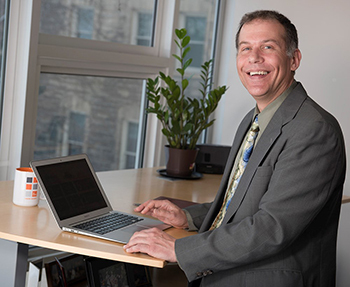 Costello Staniec had served as associate provost for academic programs since July 2012. In that capacity, she was charged with ensuring the quality and effectiveness of academic programs and the academic success of Syracuse students. She oversaw development of policies and programs that promote instructional quality, advising effectiveness and positive student outcomes; and advanced interdisciplinary academic programs aligned with institutional strengths, faculty expertise and interest, and demand. Among other achievements during her tenure, Costello Staniec envisioned and created a new student-athlete academic support unit; created the Office of Assessment and Accreditation and initiated a campuswide annual assessment program; instituted the campuswide advising program Orange Success and a degree audit system; and oversaw revisions to the University’s academic integrity policy. As associate provost, she also had responsibility for ensuring the University’s continued accreditation by New York State and the Middle States Commission on Higher Education. In that capacity, she wrote the successful 2013 Middle States Periodic Review Report as well as the 2016 Middle States Self-Study design, which sets the foundation for the 2018 decennial review. She also served as a key member of the Academic Strategic Plan Steering Committee and as a co-facilitator for the plan’s preliminary implementation phase. Costello Staniec came to Syracuse University in 1999 as a member of the civil and environmental engineering faculty. Prior to her appointment as associate provost, she served as associate dean of student affairs in the College of Engineering and Computer Science. She plans to take a one-year leave and then resume her teaching and research activities as a member of the college’s faculty in 2017. Fake News and Twitter Fights, Can They Continue?